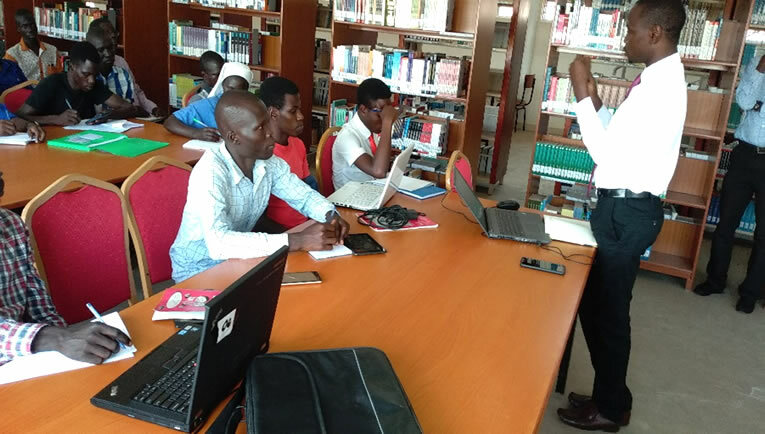 A three-day Library training was concluded on Wednesday 28th March 2019 to Mark this year’s Library Week celebrations. According to the Librarian Muni University Dr.FrederickMukungu,this year’s focus was to educate the internal stakeholders on Utilizing information resources in the library to enhance learning and job performance. During her opening remarks, Professor Christine Dranzoa thanked the Librarian and his Team for organising the Library trainings and appealed for the trainings to be done routinely. She said for one to be a good publisher,they must know the protocol hence the training is critical to acquire knowledge on publishing and where to publish from, challenging the Assistant Lecturers to have at least 5 publications and Senior Lecturers to have at least 10 publications which are referenced. Rev.Fr.DrOdubuker, the University Secretary/ Accounting officer also appreciated the Library Team for the training saying it is much needed for the Academicians especially when they are vouching for promotions,it is required that one should have contributed to the body of research and knowledge, he cautioned them to make publications and identify the core functions and up their performance and build their research portfolio. He revealed that there are vacancies for Professors which are not yet filled challenging the Academicians to work hard to get to fill the positions saying one becomes a Professor through Knowledge and what they are able to give. “This training is good for awakening awareness in us,a university exists to do Teaching and Learning, Research and Community Engagement “he concluded. Muni University Library Week is an annual event organized by the Library as part of the Outreach program to extend information services to the University community and the external community. It highlights the valuable role Libraries and Librarians play in transforming lives and strengthening communities. Muni University Library Week stems from the International Library Week always celebrated in the month of April every year. However, Muni University Library, always conducts it in the month of March taking into consideration the University activity calendar. This year’s theme is “Utilizing information resources in the library to enhance learning and job performance”. This theme underpins the role of information resources in enhancing Students’ learning and Staff job performance. The Library Week kick started on Monday 25 March 2019 and ended on Wednesday 27 March 2019. This year the Library organized featured trainings in different topics for both students and staff. On Tuesday 26 March 2019, the training focused in the area of research and publication, while on Wednesday 27 March 2019 the training focused on data analysis using SPSS & reference management tools for research.